Any questions about the channel manager module or Lodgit Desk in general? Don't hesitate to get in touch with us. With online booking portals such as booking.com or HRS, you can reach potentional guests more easily and fill your vacancies better. But those portals have to be tended to, as well, and editing availabilities, allotments and rates can be quite time-consuming. If you're using more than one online channel and often receive bookings, this can take up to several hours per day. For smaller establishments, that's almost impossible to handle. In order to minimize the workload in tending to those channels, Lodgit Desk now offers a Channel Manager Interface as an optional additional module. With the channel manager, you no longer have to manually edit the availablities or allocate different rentable units to each online booking engine. The 2-way-interface imports online bookings from these channels quickly into Lodgit Desk and sends newly unavailable times directly to the other channels which significantly lowers the risk for overbookings. DIRS21 channelswitch allows central data maintenance and automatic data synchronization from DIRS21 to BOOKING, Hotel.de, HRS, Venere, Expedia, netHotels, Unister, TOMAS, intobis and netHotels. Through the two-way-interface to all booking portals, you can not only send vancancies and rates but also receive bookings directly into Lodgit Desk. 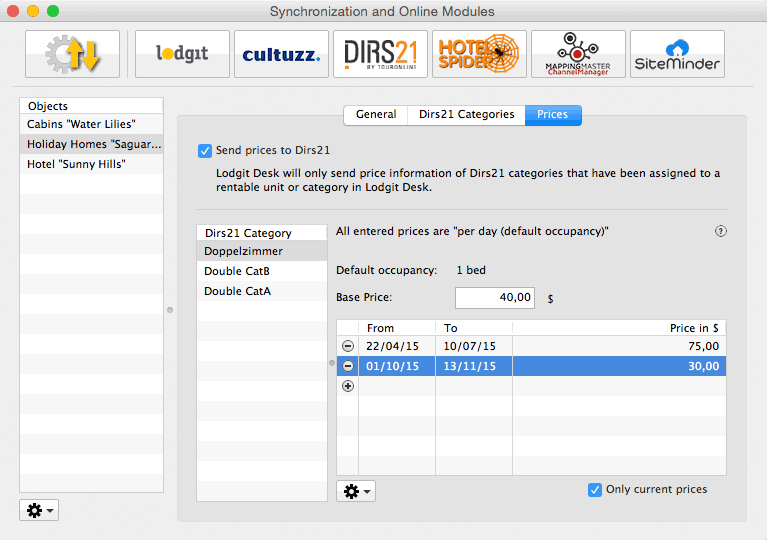 Updating the DIRS21 channelswitch can be done with the channel manager interface in Lodgit Desk. Hotel-Spider offers a wide range of channels to connect to. And several of these channels are small, local channels such as booking Valais or Thuringia Tourism. The two way interface allows you to send vacancy changes to the channel manager and receive incoming bookings directly into your hotel software. MappingMaster is a brand new channel manager also allowing you to connect numerous channels to the hotel software for a comparatively small fee. Owners of guest houses, hotels, hostels, motels and holiday apartments can send vacancies, prices and even cancellations to all booking channels simultaneously. Thanks to the integrated 2-way-XML-technology of the MappingMaster channel manager overbookings can effectively be prevented. SiteMinder is a channel manager that is used in more than 150 countries. Connections to more than 250 channels allow you to turn interested travellers into guests of your own. The two-way-interface from Lodgit Desk to the channels allow you to send your vacancies and rates via Siteminder to your channels of choice and receive bookings directly into your hotel software. If you have another channel manager you want to recommend to us, please don't hesitate to contact us. As an additional module, the Channel Manager must be added to your existing license before you can use it. It is available for a monthly fee of €1.00 per rentable unit (plus 19% VAT, where applicable) in our online shop. Because this module is tied to a Lodgit Desk license, it may only be purchased for the entire term of that license. If you are purchasing a new license or renewing your current license, the module's term is the same as that of the license purchased. If you are adding it to a current license, the module's term ends with the expiration date of that license. The use of the Channel Manager module requires an account with the channel manager provider (see above) as well as the online booking engines you want to use. That may incur further charges. The following restriction applies if the module "Interface: Channelmanager" is used simultaneously with the module "Online-Systems" in Lodgit Desk: For technical reasons, the number of rental units booked for the "Interface: Channelmanager" module can only be less than or equal to the number of rental units in the "Online-Systems" module.